Note: This review is based on the Genesis version of Gain Ground. This version of the game can be found on Sonic’s Ultimate Genesis Collection for the Xbox 360 or PS3 or in the Wii’s Virtual Console library. Gain Ground started life as a largely unpopular 3 player arcade game. Surprisingly when taking into account the relative lack of commercial success it was ported to the Sega Megadrive/Genesis and Master System pretty swiftly. The gameplay is similar to Gauntlet but with a fantasy/sci-fi setting. Unlike Gauntlet, Gain Ground doesn’t scroll; it’s a one-screen affair for every level. Every level/screen has strategically positioned enemies. To clear a level, you must either dispatch every enemy or advance all of your characters to a marked exit. Going too slow can be devastating: if you’re not able to kill all of the enemies or get all of your characters (who have different walking speeds) to the exit before a timer runs out, you lose the characters who haven’t reached the exit. Once your last character is gone, the game is over. Lucas M. Thomas has difficulty describing Gain Ground while calling the game “inarguably unique.” Thomas opens his review with “You wouldn’t think to find a strategy game in an arcade [in 1988].” Why not? Missile Command, for example, hit arcades in 1980. Like Missile Command, Gain Ground isn’t purely a strategy game, but it requires strategic thought in addition to good reflexes. Enemy placement in Gain Ground determines much of the strategy in Gain Ground. For some levels, not all enemies are on the screen initially, so paying attention to the enemy counter on the left side of the screen is essential. Since off-screen enemies can rush onto the screen during already tense moments, awareness is key to advancing. Without a combination of awareness and reflexes, Gain Ground becomes a trial-and-error game, which puts you at a significant disadvantage given the lack of continues. At the same time, each new game of Gain Ground means you have that much more knowledge about when and where enemies will ambush. You can’t develop the best strategy until you know how the game attacks. Strategy in Gain Ground changes based on whether you play alone or with another player. In a two-player game of Gain Ground, one player can draw fire from a stationed enemy so that the other player can sneak to the exit or attack the distracted enemy from a better angle. Such tactics are not available in a one-player game, as you have to commit to the strengths and weaknesses of every character you select. Specifically, before you select a character in Gain Ground, you can see the level and on-screen enemies, so it’s important to scope the level and choose the most appropriate character to begin your attack. There is a catch: the timer for the level runs as you select your first character. As a single player rushing to save time, you might overlook an enemy on top of a building that can’t be killed by your chosen character. Depending on your goal for the level (killing every enemy or reaching the exit with every character), this mistake might translate to significant lost time. But if you’re playing Gain Ground with another person, that person’s character might be able to kill the enemy on the building with a special shot or, at the very least, draw the enemy’s fire away from your character. Frank Provo doesn’t suggest such strategy was historically significant in arcades, instead calling Gain Ground a “haphazardly conceived” real-time strategy game, which ignores the button-pressing action of the game. Provo’s assertion that “it’s nearly impossible to get the hang of the details” raises the question of whether he’s aware of the extreme challenges of other games during the 1980s (Gain Ground is not “impossible” compared to Sega’s 1987 masterpiece, Shinobi). But as inaccurate as Provo’s “real-time strategy” label is (Gain Ground isn’t even a distant cousin of Starcraft), he is right to acknowledge the game’s attention to detail that makes its action unique. Ironically, the first sentence of a banal overview at Giant Bomb does a better job than most describing Gain Ground’s significance in genre terms: “Gain Ground is a top down shooter that focuses on tactics.” Shooting and tactics should sound familiar to the modern gaming world, but old shooters of all kinds, from Asteroids to Space Invaders, required players to learn strategies to be successful. What separates Gain Ground’s shooting from that of other 1980s games is the sheer amount of factors the player must account for in order to be successful. You shoot a lot in Gain Ground, and you shoot in numerous ways. Some characters shoot right-handed while others shoot left-handed, which makes accuracy a concern, especially when you are flanked by enemies not lined up with your dominant firing hand. Additionally, every character has his or her own regular and special shots. For instance, one of the three starting characters (second row, fourth from left in above image) has a regular short-range pistol shot that can be fired in any direction. This character’s special shot is a long-range pistol that can eat away at enemy lines from a distance, but the shot can only be fired in one direction (north). Many of the special shots in the game can only be fired north; that’s why characters with special shots that can be fired in all eight directions are coveted. For example, two archers (first row, third and fourth characters from left in above image) share a special arrow shot that can (1) hit enemies from a longer distance; (2) fly over walls to hit enemies on the opposite side; or (3) hit enemies on higher ground, where most shots cannot reach. The viking archer with blonde hair can fire this special arrow in every direction, meaning he can dispatch enemies that other characters, including his archer counterpart, could never kill. However, while the archer with gray hair can only fire the special arrow north, his north-traveling arrow can travel an even greater distance. The catch for both archers is that their special shot flies at an arc, so if you try to shoot an enemy too close to you with the special arrow, the arrow will fly right over the enemy. You must be aware of the distance the arrow must travel before it can actually kill (similar to the attention one must give to the L-shape attack of a knight in chess). The key to great shooting in Gain Ground is recognizing the limitations of your characters’ and enemies’ various shots. Despite the attention to shooting tactics, the most important element in Gain Ground is rescuing characters. Since you start the game with only three characters, growing a stable of soldiers is essential to survival and flexibility to tactical problems. “Captured” characters wait for you on most levels like lost chess pieces. To rescue, you walk over the piece (so that the new character follows you) and take it to the exit. The piece can’t be damaged during rescue, but if you are shot, your character becomes another chess piece on the field. Only one piece can be rescued at a time, so if you run out of potential rescuers, the level is over and the pieces stay. (And if you kill the last enemy on a level during a rescue, you don’t get the extra character unless you hit the exit immediately.) Rescued characters become available on the next level. A failed rescue can mean death. As mentioned, if you get shot while trying to rescue a piece, this results in two pieces in need of individual rescue. If a third character gets shot while in the process of rescuing either piece, the piece you’re trying to rescue will disappear permanently. Similarly, if you enter a level and get shot, your character becomes a chess piece that can be rescued, but if the next character gets shot (during a rescue or not), the piece is gone for good. Rescuing has another dimension during a two-player game of Gain Ground. In a one-player game, the goal is obviously to collect all the extra characters that you can. But with two players, preferences and balance enter the equation. In terms of preferences, two players must agree on which characters they will individually rescue, as rescued characters only become available for the specific player who rescues them. In terms of balance, the two players must avoid one player rescuing all slow characters, for example. This oversight can result in a situation where a player has no character appropriate for tactics requiring higher walking speed. Given the positive relationship between character balance/quantity and tactical options, a successful game of Gain Ground recalls the sociological idea that a diverse set of workers can create the most efficient and effective division of labor. Unlike many shooters, Gain Ground doesn’t value the idea of weapons/items impacting the proceedings. Instead, the game calls attention to the individual qualities of characters. There is no “powering up” — you are forced to utilize unique talents and quirks to win. This demand can perhaps explain some of the lack of appreciation for Gain Ground. As shown in the image above, Gain Ground also seems to value racial and ethnic diversity. In fact, the skin color of the characters varies more significantly in the Genesis version than in the arcade version. That some characters have dark- or light-skinned counterparts can evoke brotherhood or sisterhood where a character creation option (as in Fallout 3) would not. 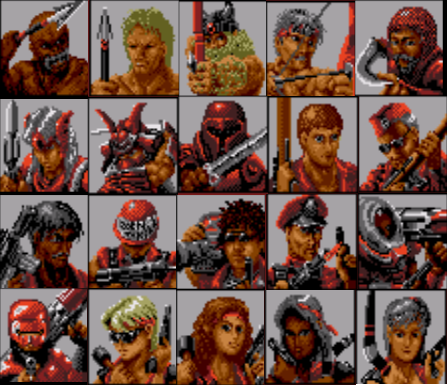 Interestingly, one of Gain Ground’s starting three characters is, on the surface, a stereotype: a black man who throws spears (first row, first from left in above image). This type of character was over the top, if not offensive, in Resident Evil 5. But in Gain Ground this character is part of a historical battle involving many peoples. The game’s inclusion of a white man who throws spears (first row, second from left in above image) suggests a common ethnicity or background, not a dehumanizing portrait. The fact remains that the appearance of diversity in a game doesn’t mean the diversity is particularly meaningful. While critics should recognize the diversity in Gain Ground (for the sake of historical game knowledge, if nothing else), one should note its extremely limited relevance to human experience and perspective. I sometimes get the sense that if, for instance, Assassin’s Creed had the skin color diversity of Gain Ground, many would praise Ubisoft without acknowledging that diversity is more about different experiences/perspectives than representation in a power fantasy (though Gain Ground is a strategic struggle rather than a power fantasy). If a modern game can’t surpass Gain Ground in terms of diversity, what has it really accomplished? References to Gauntlet and to a lack of popularity in arcades don’t address Gain Ground’s unique combination of strategy and shooting. The diverse cast of characters, rescuing, and lack of power-ups make Gain Ground more like real-time chess than most shooters, yet the enemy ambushes and multiple forms/quirks of shooting emphasize the importance of reflexes and awareness. The diverse cast also raises questions about the meaning of diversity and can inform us on the accomplishments of modern games. Given the relative lack of discussion on the game’s significance, Gain Ground is the most underrated masterpiece Sega has made.